If you are a leading surgeon in London?s most prestigious hospital and you are delivering the ?Lecture of the Year? to a hundred of the world?s leading physicians, the last thing you want is a distraught mistress from 20 years ago turning up. Well Dr. Mortimer can cope with that, but when the erstwhile mistress says that the result of their past union was a baby boy, he is more than gobsmacked. And when the ex-mistress then tells him that the baby boy, now a strapping sixteen-year old, is waiting outside to be introduced, there is only one course of action ? send for faithful friend, Dr. Bonney. Typical Cooney complications ensue involving a police sergeant, Dr. Mortimer?s wife, a severe hospital matron and Dr. Bonney?s mother, although why Dr. Bonney has to impersonate both matron and Al Jolson is too complicated to explain here. THEY say laughter is the best medicine and I received an unexpected dose while watching this hospital based farce from the undisputed king of the genre, Ray Cooney. I say unexpected because farces usually leave me cold and while some of the jokes are dead on delivery this is a fun, frantic and perfectly paced evening’s theatre. Dr David Mortimore’s past catches up with him when an old flame turns up at his hospital with the sort of Christmas present he wasn’t expecting in the shape of the son he’s never met. Leslie is the archetypal angry young man, desperate to find his real dad. Mortimore, on the other hand, is desperate to keep his true identity a secret and his hapless colleague Dr Robert Bonney ends up covering for him. Throw a batty old boy into the comedy mix in the shape of Bill (Graham Simmonds) and you have the recipe for laughs. Bill has keen eye for the ladies and a raging libido to boot and Simmonds relishes and shines in the same way Jonathan Black enjoys the incurable schemer Dr David Mortimore. Mike Shaw rises to the many challenges playing Bonney throw up. This is a real test of his verbal and visual comic skills. Nobody looses their trousers in this play, just their dignity. All in fun of course and you’re sure to enjoy the later scenes involving a decidedly “under the weather” Matron, played by an excellent Jill Ratcliffe. Director Alan Clements certainly gets the best out of cast who give the distinct impression they would happily stay on stage all night. While I wouldn’t go as far as to call myself a convert, this entertaining production has made me look at farces in a whole new light. Great escapism – go and wallow in the silliness. WHAT better setting could you have for a farce than a hospital? Ray Cooney?s It Runs in the Family at Altrincham Garrick Playhouse with its twists and turns and exaggerated characters is set in such a place. Jonathan Black captures his situation well and is especially amusing when he prepares for an important lecture. His sidekick is Dr Hubert Bonney, played with appropriate eccentricity by Mike Shaw. 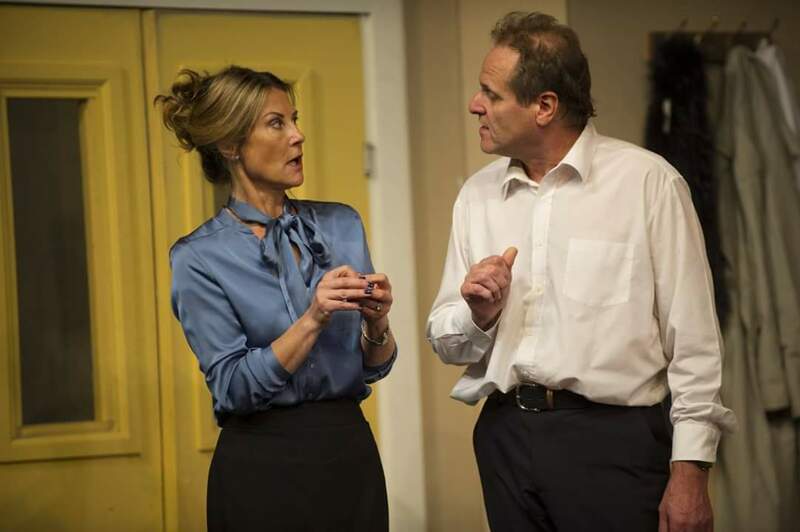 He comes to the rescue when Dr Mortimer?s former mistress, Jane Tate (Lise Banks) turns up to tell that someone from his past is waiting to see him. To add to the deception, Dr Mortimer?s wife, Rosemary, a forthright Claire Mather, is there and has to be kept in ignorance of the truth. Graham Simmonds? does well as Bill, a patient who gets caught up in the tangled web of deceit. The youngest cast member, Oliver Knowles, plays the son perpetually searching for someone. I am impressed with the fast pace maintained throughout, a credit to director Alan Clements. As the action gets faster and faster and more complicated you realise the hours of practice that have gone into making it such a success. Mix in some cross dressing and you have the perfect recipe. 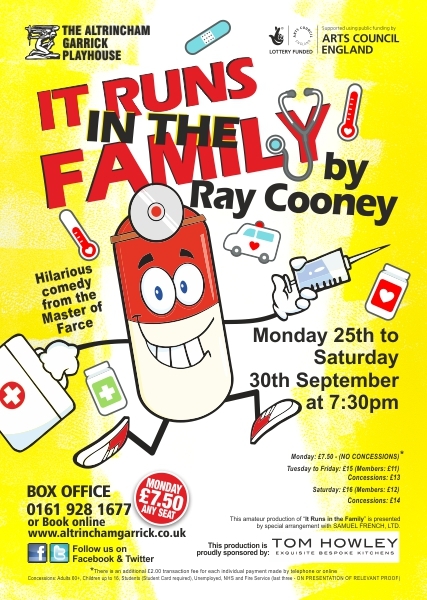 Written by “farceur par excellence”, Ray Cooney, ‘It Runs In The Family’ is a superb British farce, full of miscommunication, misunderstandings and mishaps. I’m not usually a fan of farce as I generally find it very frustrating but tonight’s performance at The Altrincham Garrick had me chuckling and laughing out loud virtually all evening.?? A perfect antidote to a grey Monday! The plot is intricate but actually not too difficult to follow ? although it is obviously quite ludicrous which is what makes it so funny.??? Without revealing any spoilers, the basic premise is that Dr David Mortimore is preparing to give a very important lecture which could possibly put him in line for a knighthood.??? Along comes a past lover from nineteen years ago plus her eighteen year old son… Throw in a vicar with piles and gout, a confused Policeman and a non-existent dog called Les and you have all the makings of a perfect evening! The stars of tonight’s show for me were Dr David Mortimore (Jonathan Black) and Dr Hubert Bonney (Mike Shaw).? Their performance is the bedrock for this production.?? They have perfect comic timing, great expression ? and they both look great in blonde wigs.?? Dr Bonney is the perfect stooge to Dr Mortimore’s ‘straight man’ and the two of them together are comedy gold.?? Hold on to your sides when Dr Bonney has a case of mistaken identity with Matron and look out for his coy yet seductive rendition of ‘Falling In Love Again’.?? This was one of the high points of the evening and showcased Mike Shaw’s versatility.??? He is clearly very at ease in a comedy role and he carries it off perfectly. The comedy is well paced with excellent timing.?? Jonathan Black plays his role as slightly caddish Dr Mortimore with suave ease, whilst Mike Shaw’s fraught and frantic Dr Bonney is hilarious and totally entertaining. As with most farces, there is an element of physical comedy which is well directed and acted without being too over the top ? the window scene had the audience almost crying with laughter and it was extremely well executed by everyone and with excellent attention to detail.?? Director, Alan Clements, has done a wonderful job, it would be easy for some of the scenes to descend into overacted chaos but they don’t and it was clear to see that much work has gone into ensuring that this show retains all of its excellent humour without becoming too slapstick. The set is excellent ? you are in no doubt straight away that the play is set in a hospital and there was good use of the stage and the various doors and windows.? Credit to Juliet Jones, the set designer, as this is one of the more robust and well constructed sets that I’ve seen. There were a few fluffs and just one or two moments when I wasn’t sure whether a couple of lines had been forgotten ? I am sure this was nothing more than first night nerves and it didn’t detract from the enjoyment at all.?? The proof of the success of this production was demonstrated by the audience reaction tonight, there was barely a moment when people weren’t laughing.? Congratulations to all involved, it was a thoroughly entertaining and hilarious evening. North West End Rating: ???? This amateur production of ?It Runs in the Family? is presented by special arrangement with SAMUEL FRENCH LTD.